Two years after the launch of the 35mm F1.4 DG HSM A, the first model in its highly-respected Art line, Sigma has finally introduced an 85mm version. Announced in February 2016, the $749 Tamron SP 85mm f/1.8 Di VC USD (Tamron 85mm f/1.8) is a fast, short telephoto prime lens available in Canon, Nikon, and Sony lens mounts. This review considers the performance of the Nikon version. Nikon’s latest flagship FX-mount, full-frame DSLR — the D5 — is a performance powerhouse, featuring a new 153-point autofocus system and 12 fps burst shooting of up to 200 14-bit RAW files. Designed for the traditional customer base of sports, press and wildlife pros demanding top performance, the D5’s increased 20.8Mp resolution and enhanced low-light capabilities has further broadened the D5’s appeal. As well as boasting enough pixels for advertising, magazine, and even landscape photography, the D5’s image quality improvements at the mid-ISO 1600–12,800 range will interest a range of professionals looking for great results in low light. With its natural perspective and selective focus at maximum aperture, the 85mm f/1.4 is the perhaps the most coveted of short telephoto lenses for portraiture both indoors and out. 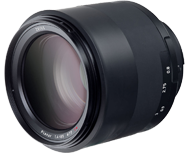 This new manual-focus lens from high-end maker Zeiss replaces the earlier 85mm model from the maker’s Classic line, and features a new optical design and an exterior resembling that of the no-compromise Otus models.